A multistate police investigation has led to the dismantling of a major drug distribution network and the arrest of suspects believed to be in charge of or affiliated with the operation, according to Maryland State police. WASHINGTON — A multistate police investigation has led to the dismantling of a major drug distribution network and the arrest of suspects believed to be in charge of or affiliated with the operation, according to Maryland State police. On Feb. 23, multiple state agencies acted on search and seizure warrants connected to the case. According to police, the organizer of the network and several people who were affiliated with it, along with around $1 million worth of contraband, were taken into custody. Police say indictments of dozens of other associates of the operation are pending. The investigation involved police agencies from Maryland, Virginia and Delaware and focused on a network that operated between the three states with a heavy distribution network set up on the Eastern Shore. Police say 33-year-old James Martell Frazier, of Cambridge, Maryland, and Seaford, Delaware, was the leader, supervisor, financier and manager of an illegal drug network that spanned multiple states. Frazier had been identified by law enforcement agencies as the largest illegal drug supplier in the Eastern Shore area of Maryland, Virginia and Delaware during prior investigations. Frazier was taken into custody by Delaware State police and was charged with multiple counts of possession with intent to sell heroine, cocaine, methamphetamine and marijuana, along with possession of an illegal firearm and several counts of second degree conspiracy, among other charges. Police also arrested 37-year-old Trivette Jackson, of Federalsburg, Maryland, and Dover Delaware, and 25-year-old Donisha Holland, of Seaford, Delaware. Both face multiple charges of possession with intent to sell. Holland was charged with three counts of child endangerment. 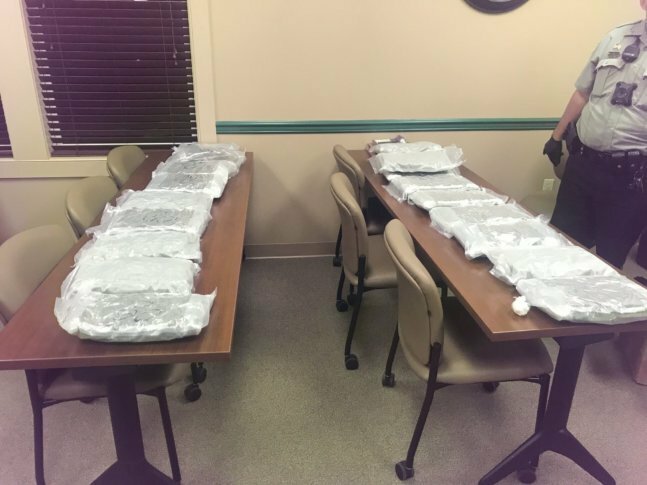 Maryland State police say the investigation began in the fall of 2018, as Frazier’s drug network was bringing in large quantities of heroine-fentanyl mixtures, methamphetamine, cocaine and marijuana from New York, New Jersey and Pennsylvania and distributing them throughout the Eastern Shore.